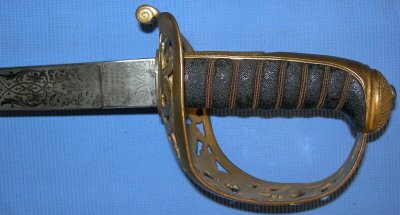 In very good condition, a Victorian British Royal Engineer's sword, dated to 1865, with scabbard. 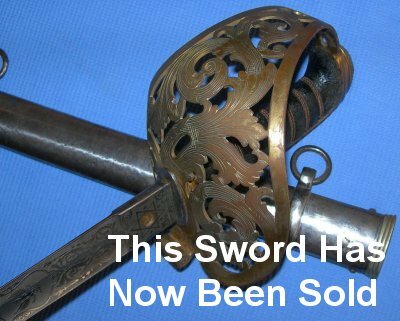 A well above average example of this beautiful sword with its gilt on brass acanthus leaf hilt. Wilkinson Sword made with serial number 13819 for 1865, the Wilkinson sales ledger still exists and the buyer can easily research the original purchaser / owner (costs 19 GBP and they refund if there is no data for this serial number). The 32 1/2 inch blade is in superb condition, the etching is equally superb and as clear as the day the original owner took delivery of it. As well as the obligatory Victorian cypher and Royal Engineer's crest, there is a family crest of a phoenix rising. The hilt has some loss of gilt, but still looks highly impressive and reflects the age. The fishskin grip and twisted wire bindings are in very good shape, the fishskin a little worn in places but not really that noticeable. 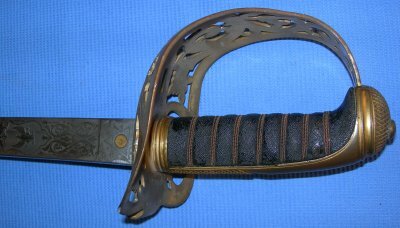 The steel scabbard is in good shape, some aging. The sword sheathes and draws exceptionally well. A superb, well above average example. Further pictures available upon request. Please quote tem reference number B83.